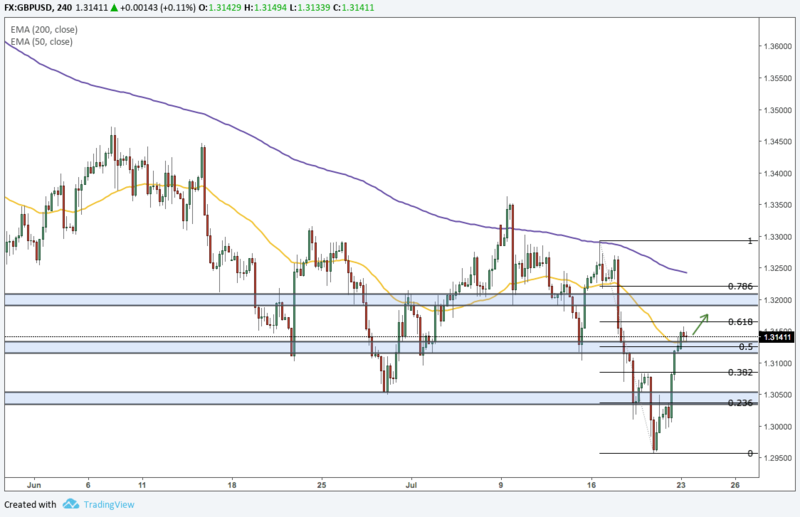 The Pound breaks above the 1.3035 resistance level and rallies towards 1.3140. Despite witnessing a series of disappointing economic data from the U.K, Sterling was able to end last week on a high note. The rise in the Pound was attributed to Trump's criticism of the Fed's rate hike policy and a strong U.S Dollar. He also threatened to escalate the trade war with China by imposing tariffs on all Chinese imports. Sterling is expected to continue being driven by the trade war rhetoric and Trump's comments related to U.S rate hikes and the strength of the greenback. For today, we have the release of the U.S Existing Home Sales figure and a higher than expected number might slow down the rise in the Pound. The Sterling broke above the 1.3035 resistance level paving the way for a rise towards 1.31895. Adding to the bullish momentum, the pair also broke above the 50-period moving average. Our expectations are that the UK currency will continue moving higher with the 1.3190 area coming into focus.